One of the many handsome "weeds" that have invaded our lawns. Forgetting the blue lawn for a bit, it wouldn't take you long to find spring beauty, Claytonia virginica. Here the flowers are almost white, but the veins are a pale pink, a trait that is variable and often more pronounced. The anthers are pink and opposite the petals (alternate with the petals is way more common), and a three parted pink stigma/style. The aerial shoots have a pair of long, thin leaves on each stem, but they are much fleshier than a grass. This plant used to be in the purslane family, but now is in the less well known Montiaceae. Those are the words from Pogo (Walt Kelly) from the 1st Earth Day poster, an event that TPP doesn't really remember well because the campus was in the throes of anti-war demonstrations and he was finishing a tough schedule of courses for a hoped for graduation. Wasn't sure what to do blog-wise for Earth Day 2018, but attended a great lecture last night by Doug Tallamy, and his thesis (see the link) is that biodiversity is only going to be saved if everyone gets involved. He advocates a small scale, grass roots (sorry, he earns TPP's admiration for hating grassy lawns.) approach using native plants, especially trees. At his website you can get his book (of course) and get a list of plants that promote biodiversity. The huge attendance at his lecture was most impressive. He argues that most land is privately owned, so public "wild" areas are not enough to reverse the loss of biodiversity. Get rid of grass; plant an oak. The biggest problem is that finding a good source of native plants isn't easy. That's why us native plant people are working to set up a nursery. Things have been busy & entire days are getting away. At any rate the weather seems to have moved away from the freezing cold over nights for now, weather guy was more optimistic, but no matter what the plants have responded & the Phactors are struggling to clean up over winter debris to let things grow. Another of Mrs. Phactor's species Tulips has appeared, and this one is T. turkstanica. The flowers are another star-shaped tulip of sort of a cream color with a yellow center. Quite bright and quite attractive. Several flowers are held just above the rather slender leaves. Again this has been a trouble free plant that seems to be naturalizing to its bed under a witch hazel shrub very nicely. This has been a tough spring, following a winter with some very deep cold. Since the Feb. thaw, the freezing weather with snow has just kept coming back. It's been very tough on the narcissi that normal have no serious problems. Even the hellebores, which are so tough you think maybe they're made of old tires, are bowed over quite a bit. So if something comes through all of that and still flowers, it qualifies as tough. This is without question the toughest and hardiest of the Rhododendrons, R. mucronulatum, Korean azalea. It isn't too fussy about soil either, so if you think you are too cold for an azalea, try this one. This image was taken 48 hrs after a snowy mid-20s night. They are quite early flowering and you never see them in garden shops or nurseries. They can be gotten via mail order, and while that means small, they do grow pretty quickly, which is good because ours keep getting broken by jealous oaks or eaten by the bunnies (only down side, without protection, the bun-buns will eat them to the ground). The flowers a very bright pink and these shrubs look great in the middle of a mixed border. This is a TPP 2 thumbs up plant recommendation. They are deciduous; the leaves in the background belong to another Rhododendron. It was just a week ago that TPP was being grouchy about the weather and all being depressing on a Monday morning. Now it's doing it again! Just a light dusting of snow, not 20 or so inches like north of here, but this fell on all the flowering bulbs, and the Korean azaleas, Cornus mas, and Prunus tomentosa. So yes, these extended bits of winter are making for a very grouchy Monday morning. The good ole boy who lived next to TPP when he was a kid always said that "if it doesn't snow on your peas, you didn't plant them early enough". Well, TPP's snap peas went in the ground on Saturday, so no signs of their cotyledons yet. None were actually expected. Funny how few people notice little things like that. Suggest that you germinate a bean and a pea so you can see what a difference it makes where the shoot elongates relative to the cotyledonary node, either above it, or below it. But either way TPP needs to go shopping for snap or snow peas for a pasta dish that will be tonight's dinner, a way more cheerful thought. resolution is terrible, but those are cotyledons of a shape appropriate for radishes or cabbage or other members of the mustard family. The cotyledons of peas never appear above ground, just the epicotyl shoot. So pretty unhelpful to the novice gardener who might want to pull those other shoots up. So who does something so botanically wrong. Someone doing seed pack graphics who has never grown peas, or radishes? Some well-known seed company should be ashamed. Finally had a break in the cold, dreary weather. Now things held back are flowering at a pace TPP cannot keep up with. This particular tulip burst into flower with the first dose of sun and warmth. It's a species tulip, not some horticultural variety or hybrid. As best TPP can determine this is Tulipa urumiensis, probably native to Turkey or Iran, an area of high diversity in this genus. The uncertainty arises when you buy packs of mixed species for fun. This particular species naturalizes pretty easily and its quite attractive, a bright, cheerful, somewhat fragrant, reminder of spring, in the middle east. The only downside is that the flowers only open when the sun is shining on them. It would have to be a Monday. It snowed last night about an inch; not enough to bury or hide the blue lawn completely. And of course it's still cold. The whole thing is pretty depressing. Still have lots of leaves to remove from beds and the bases of shrubs and perennials, but don't want to uncover the new shoots too soon. The delayed spring results in forced inactivity, and that is also sort of depressing. A series of emails about kapok reminded TPP of the tropics, and how different it is in tropical places & a certain longing for the tropics looms up, and you want to go. Fortunately this snow is almost gone already, and a 70 high is predicted in just a few days. Or is it just a setup for another weather disappointment? No choice but to wait & see. After years of observation, you don't figure to see too many things that are new in your gardens. Then who shows up at your squirrel feeding station? A black squirrel, more correctly a melanistic squirrel. TPP doesn't know the genetics of melanism in squirrels, but no question this one is black. More or less regular colored fox squirrel is shown for the contrast. All are in training for the fattest squirrel competition. A few years back we had some pale squirrels around with white or nearly white bellies, but they did not persist in the population. Different names means they are different. Take a look. While walking through our gardens, the F1 asked a good botanical question. Is that just a pale squill or is it something different? The answer is actually it was just a pale squill, but in another part of the gardens there is another species that looks superficially like a pale squill. Here they are together. The pale squill looks just like regular squill except it is a nearly white pale blue. 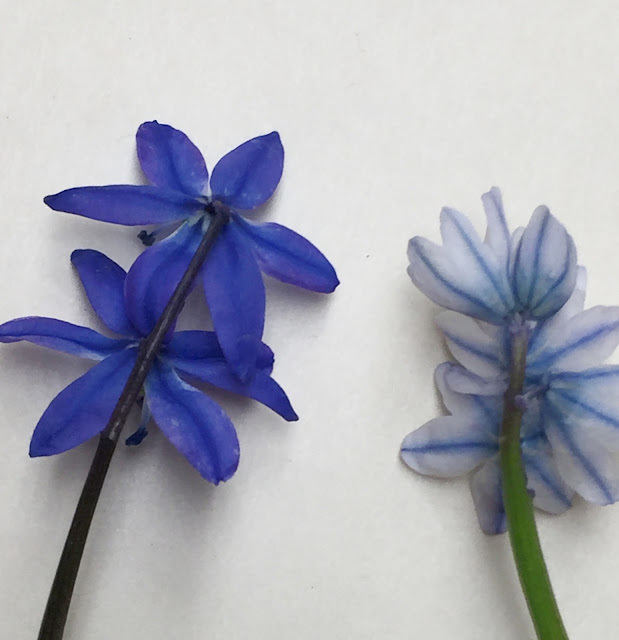 What you see here is Scilla siberica (left) and Pushkinia scilloides (right). The flower sizes are similar especially when newly opened, and the coloring along the midvein of the showy perianth (petals) parts is darker. 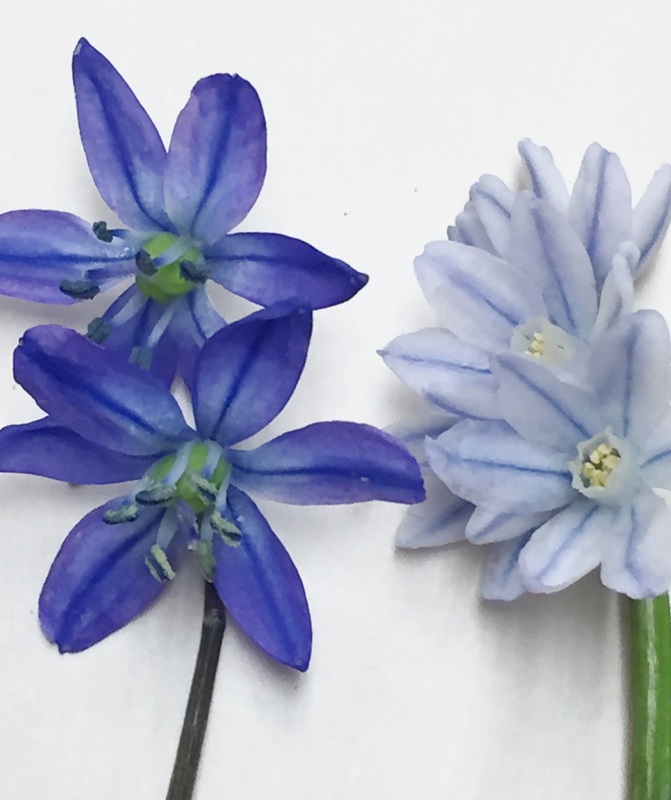 The squill perianth opens more widely. The Pushkinia stays more bell shaped. Flipping them over shows a lot more differences. The squill has longer stamen filaments and blue anthers, and usually only 1 or 2 flowers per stalk. The Pushkinia has shorter, flattened filaments fused into a column with yellow anthers on the inner surface surrounding a smaller pistil, and usually more than 2 flowers per stalk. Now to make matters slightly more complicated, your lawn might also have (TPP doesn't, but his previous lawn did.) Chionodoxa, glory of the snow, concurrently flowering as well. Its flowers are also blue, but tend to be slightly bigger, to face more upwards, and to have lighter-colored centers. Both can naturalize and spread across your lawn. Wow, not only is peak blue late this year, but even then in total defiance of Eostra's influence, peak blue is being whitened. What a difference a day makes when it comes to weather in these parts. To the best of our knowledge Peak Blue has never been snowed on before. It must be because of the French-Canadian is here. Compare with this image from TPP's most recent peak blue post just one day ago from as close to the same place as is possible. Mrs. Phactor has declared this downright depressing. Labels: peak blue, snow, spring flowers, spring weather. Eostre is an ancient goddess of spring, and because of some weird dating mechanism based on a lunar calendar, this year the religious holiday superimposed upon this honorable pagan celebration occurs on April 1st, which is often called April Fools Day, a widely disliked display of foolishness. The religious holiday has no significance for this writer, and it wasn't something that was part of mix of messages, and it was more like Mother Nature was playing an April 1st joke on all of us. TPP always looks forward to spring, and usually by this time 30 to 40 plants in our gardens have commenced blooming (or even come and gone). This year, 2018, only 17 plants have started flowering, and three of these events were recorded yesterday on 31 March. And today will be a sort of joke about spring because it is cold and tonight the temperature may be cold enough to be damaging to even quite hardy plants. This morning in the local newspaper an article about houseplants quoted a horticulturalist as saying "the mental health benefits of plants are obvious." TPP would concur, growing plants is highly therapeutic, and TPP can think of no person he deeply dislikes who also grows plants, and some of the worst would have to be coached "green side up" if they were laying sod. So today's weather, and its impact on TPP's plants is rather depressing. So come on Eostre, some fancy bourbon has been sacrificed (spilt) in your honor, and yet we get more cold, and even snow is possible. OK TPP admits that the upper Midwest's weather may be beyond the abilities of an ancient goddess (but it was well-aged bourbon). At any rate let's get this last gasp of winter over with. TPP will attempt to cheer himself and others around him by cooking something semitropical and warming. Maybe even indulging in a rum-based cocktail.